First Lines: The place was an old Victorian, boarded up for years. No telling what I might find in there. Emma Chizzit is tall, broad-shouldered, outspoken, and old enough to collect a bit of Social Security. But she's not one to "sit home, trying to eke out an existence," so she's the owner and operator of A-1 Salvage in Fairville, California. Contracted to clear out an old Victorian house so it can be turned into a clubhouse for Belle Damien and her developers, Emma doesn't find salvage that she can turn into cash. No, she finds the mummified corpse of a strangled infant instead. Emma reports her findings to the police, who seem rather amateurish and apt to chalk the whole thing up to being an inexplicable old case. But Emma's "not much on inexplicable as an explanation-- especially when people start following [her] around." Much to her horror, she finds herself being romantically pursued by Vince Valenti, a kindly but oafish police officer. Compelled by her sense of justice (and an overwhelming desire to snoop), Emma continues her investigation, surrounded by her friends and the relentlessly helpful Vince. I enjoyed this deftly plotted and fast-paced mystery. The secondary characters are perfect in their small roles, particularly her friend and landlady Frannie and the smitten Vince. In fact, every time Vince appeared, I had the urge to duck out the nearest door in an attempt to escape the poor man. Emma Chizzit is a fascinating character. She's older, smarter, knows how to work hard and not do anything unduly foolish. Except for her small group of friends, she keeps herself to herself and doesn't say much at all about her past. This makes her a bit mysterious, and what little I did learn about her made me want to know more-- which is why the other two books in this series are on their way to me now. 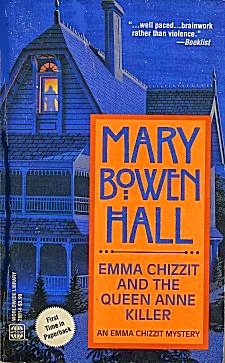 If you're in the mood for a quick mystery fix with a strong central character, give Mary Bowen Hall's Emma Chizzit novels a try. Cathy - I always like it when a protagonist isn't - er - twenty any more. And what an interesting business to be in too - cleaning things out of old houses. Even in real life, you never know what you'll find. It is refreshing, isn't it? I'm just about to start reading the third in Mike Befeler's "Geezer Lit" series about an octogenarian who has problems, but he doesn't let them slow him down. That pretty much describes all the "over twenties" that I know!